After living in Northern Michigan most of my life, I have become used to seeing white-tailed Deer. I have even seen a few very nice bucks with unbelievable racks. But after visiting Yellowstone NP, I knew I might be in for a real treat. Even after seeing so many white-tailed deer, I was still not quite prepared for the sight of a full-sized bull Elk. This animal truly towers over its deer relative, the difference in size is astounding. The harem that followed the bull Elk around was just as stunning. 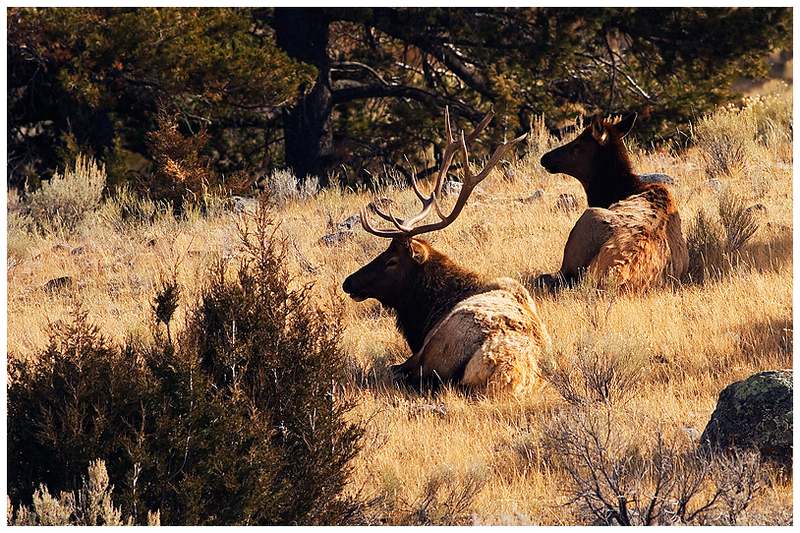 There were at least twenty female Elk and one juvenile male Elk sitting around in the group. I am very excited to visit this area again and photograph these animals in the field, standing, grazing and running. I hope everyone enjoys! Technical details: Canon 7D, Canon 400 F5.6 L lens, Tripod, ISO 100, F/8, 1/640th.